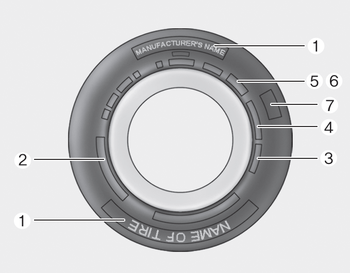 A tire’s sidewall is marked with a tire size designation. You will need this information when selecting replacement tires for your vehicle. The following explains what the letters and numbers in the tire size designation mean. P - Applicable vehicle type (tires marked with the prefix “P’’ are intended for use on passenger vehicles or light trucks; however, not all tires have this marking). 235 - Tire width in millimeters. 19 - Rim diameter in inches. 108 - Load Index, a numerical code associated with the maximum load the tire can carry. T - Speed Rating Symbol. 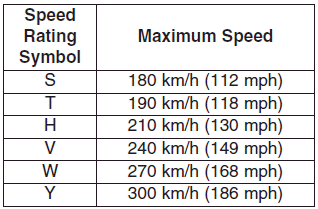 See the speed rating chart in this section for additional information. 7.5 - Rim width in inches. DOT XXXX XXXX 1617 represents that the tire was produced in the 16th week of 2017. Regardless of the remaining tread, we recommend that tires be replaced after approximately six (6) years of normal service. Heat caused by hot climates or frequent high loading conditions can accelerate the aging process. Failure to follow this warning can result in sudden tire failure, which could lead to a loss of control and an accident involving serious injury or death. The number of layers or plies of rubber- coated fabric in the tire. Tire manufacturers also must indicate the materials in the tire, which include steel, nylon, polyester, and others. The letter "R" means radial ply construction; the letter "D" means diagonal or bias ply construction; and the letter "B" means belted-bias ply construction. The temperature grades are A (the highest), B, and C, representing the tire’s resistance to the generation of heat and its ability to dissipate heat when tested under controlled conditions on a specified indoor laboratory test wheel. Sustained high temperature can cause the material of the tire to degenerate and reduce tire life, and excessive temperature can lead to sudden tire failure. Grades B and A represent higher levels of performance on the laboratory test wheel than the minimum required by law.